The world of sports has always been dominated by exceptional achievements. It is indelibly carved into a precise moment in time when the accumulation of a lifetime of efforts culminates into a victorious epiphany. A combination of a defeat of physical limitation as well as the complete and absolute annihilation of any competitors, it is a never-to-be-repeated-again ode to human greatness. Gold medalists are our peaceful heroes who carry with them the promise that everything is possible for everyone. But while their legacy is atemporal, the moment they tip over from common to exceptional exists in a fraction of a second. Whether it racing against others or against the clock or accumulating more points than anyone else, there is always that one fraction of a second where he/she crosses the seemingly impossible line between an effort and an exploit. 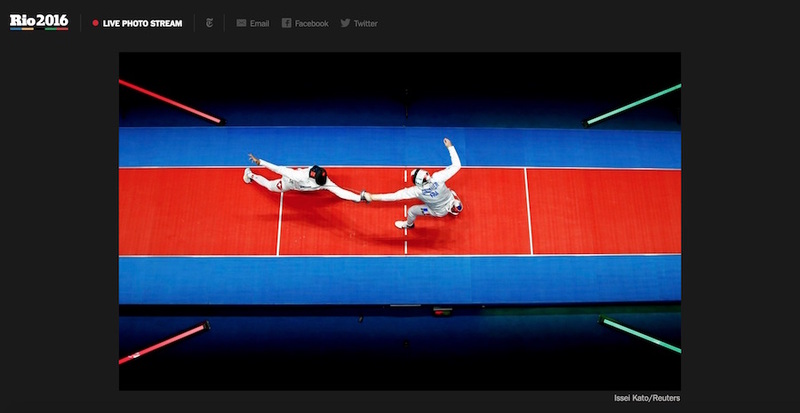 This is why sports, and the Olympics in particular, love photography. And vice/versa. And not just for those moments of glory but all of the intermediates in the process, as well as the crushing failures. If ever photography was capable of communicating the depth and summits of human endeavor, it is with sports. And for a long time, for a very long time, sport photography has excelled brilliantly because even if the event had been seen live, on tv, by millions, everyone would still enjoy returning to that moment, that one fraction of a second where everything changed, that glimpse into eternity. Sports magazine were extremely successful, all over the world, mostly because of their photos. Websites, still today, have taken up this legacy. Well aware of the final results, the photo editor can comfortably pick the right images which confirm the already established narrative. News photo editors never have that luxury. So, imagine the surprise when the other day, right in a middle of a Facebook feed, emerges a live feed of the all the sports photos being distributed by all the top news wire services. Unedited. 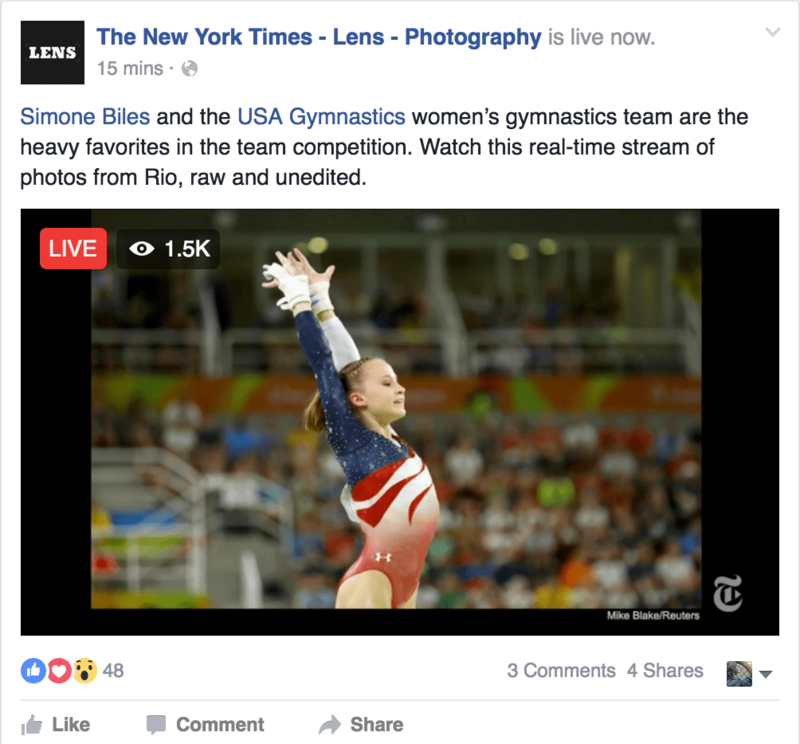 What the New York Times did ( and continues to do) is use Facebook Live to show all the images from the Olympics as they are coming in from Reuters, Getty, AP, EPA and AFP. One after the other, with no captions and just credits. And since wire services move very fast, those pictures are just a few minutes old. At last check, there were over 1,5K viewers watching this live: People, on Facebook, watching a live display of what wire services are making available for publications worldwide. The New York Times also has a web page showing the same, in a larger format. Every day, non-stop during the events. What is fascinating here is how photographs, some of extremely powerful moments, are just part of a continuous flow of photographs to be consumed and digested as one stream. Photos with no relations to each other, besides being all taken at the Olympics, pushing one another, only to vanish into oblivion. Thousands of them. No editing, no narrative, not even a context. Just photos, one after the other. And apparently, people are watching. While we have known for a while that photography has moved from individual experiences to flows ( see Instagram, for example) never has sports photography had been delivered this way by a top publication. Apparently, the New York Times is experimenting ( and will turn it into cash revenue if successful) and there is nothing wrong with it. But if they are, why wouldn’t the wire services keep that revenue stream for themselves and ignore the New York Times? They could easily display a continuous feed of their images, live, with advertising insertions. After all, the work is done already. And since the images are displayed for only a few seconds, it would not compete with their clients. Wherever this experiment by the New York Times leads – maybe live photo feeds from Syria or the US election ? – it is indicative of the profound evolution of how news photography is consumed today. It has lost a large part of its role as an exclamation point, is less and less a vessel for understanding and becoming more of an accompanying background melody to the word around us.